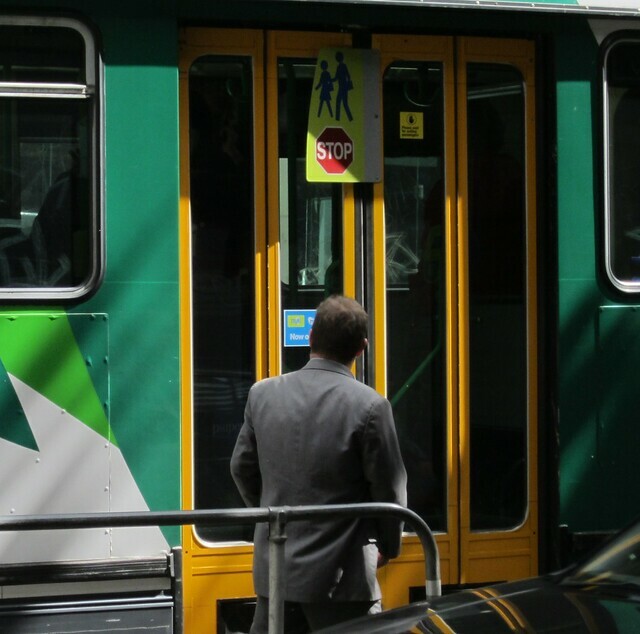 Does Yarra Trams think we’re all nine feet tall? 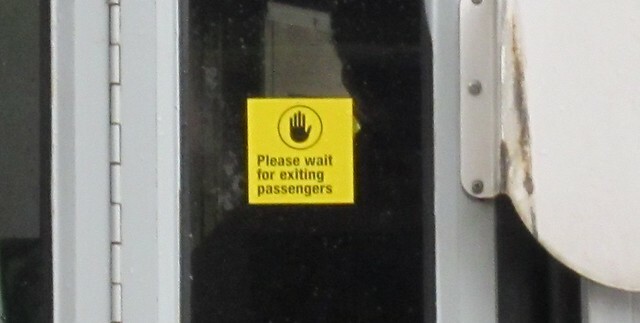 Some people do need reminding that you should let people off before barging on yourself, so it makes sense to put some reminders on the trams. Unfortunately they’re so high up that few people are likely to even notice them. From the looks of it they’ve been placed to be adjacent the internal “rhino” stickers encouraging people to take care when alighting. Perhaps that’s to reduce the clutter on the doors, and maximise visibility when looking out, but it does mean a lot of people won’t spot them. Happily, on the low-floor trams they’re lower down, and can be seen (particularly when boarding at a platform stop). In a crowded train the other day (caused by a cancellation), both I and another bloke got up at the same time to offer an old lady senior citizen of the female persuasion a seat. He caught her eye first, but as it happens another lady in need of a seat got on at the next station. A person with special needs or another person on that person’s behalf or an authorised person (conduct) may request an occupant to vacate his or her seat to enable it to be occupied by the person with special needs. It goes on to clarify that it’s referring to a seat that has been designated as a seat for use by a person with special needs. It also mentions that special needs refers to: a person who, because of age, disability, illness or pregnancy has a special need to travel in a seat. It doesn’t appear that, these days, men will generally offer their seats to a lady who is of a similar age and has no particular need to sit. But then I’m not sure I recall that was ever the case. 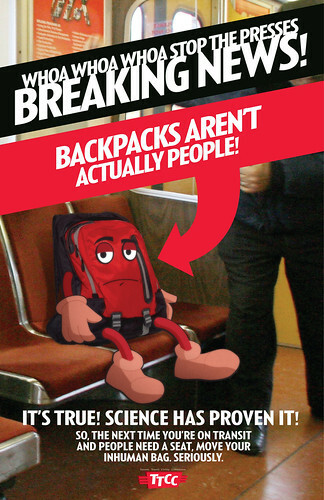 There is a widespread belief that students are legally required to give up their seats to adult passengers. Back in the day, there was that condition for holders of a Student Pass, and this was actually specified on the ticket. It isn’t anymore, not since the replacement of paper tickets with Metcards about 12 years ago. 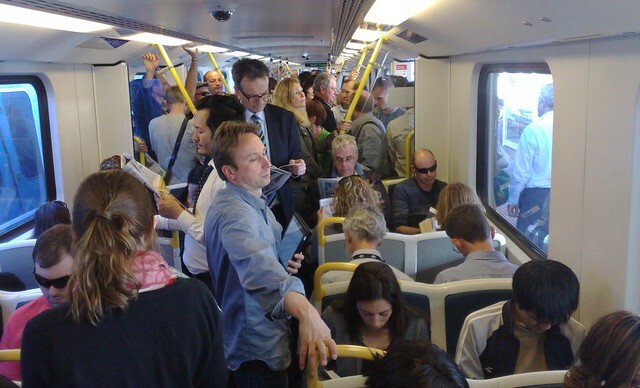 An authorised person (conduct) may request a primary or secondary school student who is using a concession ticket to vacate a seat on a rail vehicle or a road vehicle to enable the seat to be occupied by a person other than a primary or secondary school student if there are no empty seats on the vehicle to which the person has reasonable access. Interesting — unlike for people with special needs, it’s limited to a request from “authorised persons”, eg staff, police, Authorised Officers, so it’s not as though any punter can order a student to stand up for them. Of course, it’d be a lot easier to stand if more trains had handles all the way along to hang onto. Update: The rules have changed a bit. The new legislation is here. 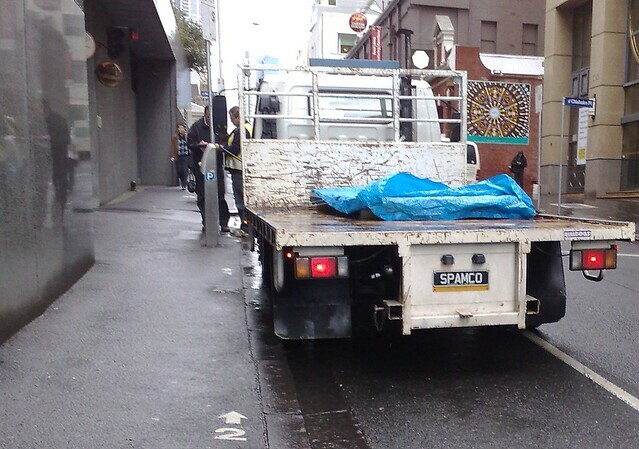 Little Lonsdale Street has busy but narrow footpaths. Something I’ve noticed is that some people haven’t figured out that when walking with someone else, it’s rude to take up the whole footpath when you encounter a person coming the other way. Generally when faced with this, I’ll just stop dead on the left hand side of the path, rather than acquiesce and step aside onto the road. (Well why should I?) They usually take a hint then and grudgingly fall into single file. From Canada’s National Post (they have a few others too, but I liked this one the best). It’s just not that hard to stub out that cigarette when you get rid of it, rather than chucking it on the ground. It’s just not that hard to look at the lights outside the lift when it arrives. If the top light is on, it’s going up. If the bottom light is on, it’s going down. It’s just not that hard to leave a message on the voicemail when you ring, rather than making me guess who it was. It’s just not that hard to look and see if the dome light on the taxi is lit up before waving frantically at it. It’s just not that hard to switch off the phone diversion when you move into my old desk, so I don’t get your calls. Especially when I left a PostIt note mentioning I’d done it. It’s just not that hard to use your indicator. It’s just not that hard to put your litter in a bin. It’s just not that hard to stand aside to prevent delaying others if you’re going nowhere.